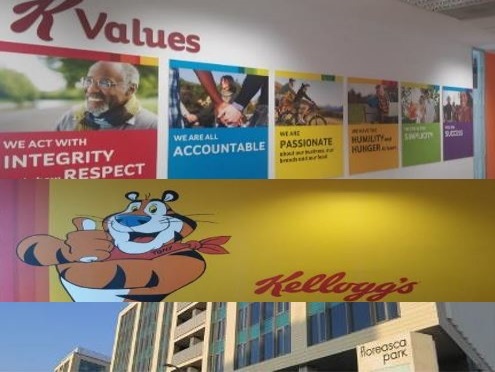 We were instructed by Kellogg`s to support them and organize all their property`s needs in order to introduce their activity on the Romanian market. Our main purpose was to adapt to their queries, but at the same time add-up value to their knowledge, making them familiar with Romanian legislation and procedures. We focused on all property’s needs, such as: technical maintenance, cleaning services, general supplies – office stationary, water supply, coffee service, security & reception services, PSI procedures, courier, event management, facility budget, implement the “building rules“ and having a close relationship with the landlord. We established a solid collaboration, with all aspects of work in continuous improvement. The most important part is the mediation with the suppliers, which brings a plus in time saving and experience in the field, ensuring the best alternative for Kellogg employees. We get involved in all projects and have a close contact with all Kellogg company’s departments, we offer support and supervision and we make sure the results delivered are according to the Kellogg expectations.